The broad advances made in the natural sciences during the nineteenth century inspired those in vision science that similar progress was possible within their discipline. Beaming with such confidence, a prominent ophthalmologist of that era stated that his profession had “furnished means more and more exact for the determination of the visual acuity and for the measurement and correction of its defects.” Studying a rock in geology, or light through a prism, is one thing; studying the eye simply as a refractive object in the skull of a live human subject is quite another. Taking ‘dead matter’ to the extreme, there was even a study conducted in 1903 that helped bolster the genetic theory of myopia based on measurements and analyses of eye sockets in cadavers. The Cartesian mind-body schism and reductionism were, thus, very much the order of the day at that stage. Unfortunately, reducing the eye to an object, cutoff from the mind and the rest of the body, remains the current orthodox vision model. For example, artists’ depictions of disembodied normal and myopic eyeballs are commonplace, comparing one to the other, such as shown in Figure 4.1. The normal eyeball, we’re told, is primarily spherical in shape, whereas the myopic eyeball is elongated into somewhat of an egg shape. This out-of-round shape is responsible for myopic blur, as images converge in front of the retina (the inside back of the eye) instead of directly on the retina for normal vision. However, bear in mind that the oblong shape depicted is highly exaggerated simply for the comparison and explanation. 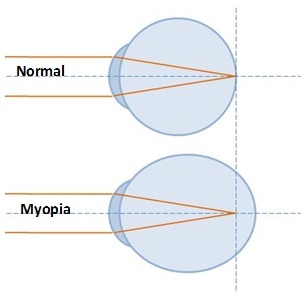 In reality, the greater axial length is quite meager for myopia, as an increase of only half a millimeter (~ 1/64″) apparently reduces acuity from 20/20 to 20/200 or worse. The status quo view contends that the elongated eyeball shape is permanent and irreversible. 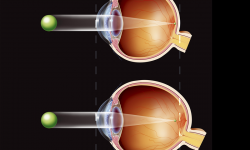 Figure 4.1 Artist’s depiction comparing normal spherical shape of eye (top) to an oblong myopic eye (bottom). The oblong shape is highly exaggerated, as the actual difference is extremely small. Myopia does not occur due to an organic change in the shape of the eyeball, but is a functional affliction caused by tension of several eye muscles. Myopia is caused by a mental strain to see objects clearly at a distance, not at the near-point as was previously suspected. Mental strain in the form of negative emotions is the underlying cause of the muscular tension. When spontaneous changes in acuity temporarily sharpen one’s focus, they are referred to as flashes of near perfect vision. In the introduction of my book, I described the first spontaneous flash I had experienced early in my natural vision improvement process. I had several more flashes from time to time before I had discovered Bates’ explanation of this phenomenon. Optometrist Antonia Orfield, in a 1994 journal article, described them as “momentary fluctuations of clarity.” She was speaking from first-hand experience, as she perceived these fluctuations during the process of completely reversing her own myopia. Orfield’s training was behavioral optometry, obtained only through post-graduate extension programs, not part of regular curricula in optometric colleges. Arthur Skeffington founded behavioral optometry, a holistic approach to vision, in the mid-twentieth century. It was an amalgamation of concepts he had developed from studying and meeting with “leaders in psychology, neurology, education and other disciplines,” including the likes of Hans Selye, Arnold Gesell and Wilder Penfield. His maxims of “vision is motor” and “vision is learned,” encapsulated eyesight as a dynamic mind-body process which is molded by the environment, potentially impeded and impaired by negative influences. Skeffington started his optometric practice in 1917 and began sowing the seeds for behavioural optometry during the next couple of decades. It’s highly probable that he would have known about Bates’ book (pub. 1920) and his regular monthly magazine, Better Eyesight (pub. 1919-1930). Perhaps such material influenced Skeffington’s thinking early on — pure speculation on my part. If that was the case, incorporating and acknowledging some of Bates’ ideas would certainly have been too damaging for Skeffington’s endeavor given Bates’ negative reputation by the establishment. Even so, behavioral optometry is derided and ridiculed to this day by the old-guard-paradigm police and their banal propaganda tactics. In any event, Bates’ theory also applied to conditions such as astigmatism, where the front portion of the eye tends to have a nonsymmetrical, warped curvature. Bates himself had the ability to produce, at will, a change of one and half diopters. He also noted the case of a surgeon at the Manhattan Eye and Ear Hospital who was similarly able to produce even greater astigmatism as witnessed by hospital staff and other eye doctors. Because myopia was determined to be a functional disorder, Bates was confident its progression could be halted and reversed. He eagerly went to work teaching numerous children and adults how to improve their visual acuity naturally. Cyclopedia of Education, ed. Paul Monroe, (New York: MacMillan, 1913), s.v. “Myopia,” 4:361. Merrill Bowan, “The Myopia About Nearsightedness, II. What is Myopia?” http://www.nb.net/~sparrow/myopianear.html. W.H. Bates, The Cure of Imperfect Sight by Treatment Without Glasses, (New York: Central Fixation Publishing Co., 1920), 14. Antonia Orfield, “Seeing Space: Undergoing Brain Re-Programming to Reduce Myopia,” Journal of Behavioral Optometry 5, no. 5 (1994): 125. 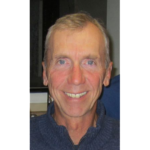 James Cox, “Our Heritage: A.M. Skeffington — The Man,” Journal of Behavioral Optometry 8, no. 1 (1997): 5. Next Next post: Why Is The Eye Chart So Clear?